TRENTON, N.J.A pet food company is voluntarily recalling dog treats that could be contaminated with salmonella. 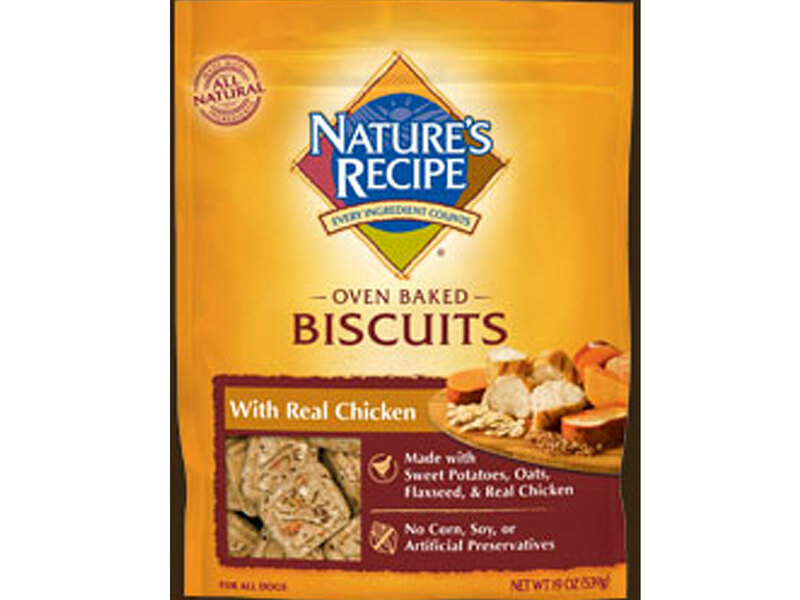 Nature's Recipe announced Saturday the recall of a limited supply of its "Nature's Recipe Oven Baked Biscuits with Real Chicken," which were manufactured at its plant in Topeka, Kan., and distributed nationally, primarily through pet specialty retailers. Nature's Recipe is a brand of Del Monte Foods. Pets with Salmonella infections may be lethargic and have diarrhea or bloody diarrhea, fever, and vomiting. Some pets will have only decreased appetite, fever and abdominal pain. Infected, but otherwise healthy pets can be carriers and infect other animals or humans, warns the Food and Drug Administration (FDA). If your pet has consumed the recalled product and has these symptoms, please contact your veterinarian. The recalled treats were sold in 19-ounce stand-up resealable pouches. The products included in the recall are marked with the Lot Codes 2199TP or 2200TP and a UPC Code of 30521 51549. The pouches also have a "Best If Used By Date" stamp of "10 11 13" and "10 12 13." For further information about the recall and for instructions on obtaining replacement product, consumers can contact the company at its web site or call the 24-hour consumer hotline at 800-237-3856.